13.1 Mile and 10K Courses for 2019! For 2019 we are upping the ante at Garland Mountain and making it our Season Finale with a half marathon course as well as a 10k course! Sign up for the Entire Trail Run Series at once and choose a bonus Hooded Long Sleeve, Headsweats Hat or Headsweats Visor! Details on the Registration page. At the series finale (Garland Mountain Half Marathon and 10k) we will present awards to the top three finishers in each category, in both the long and short course distances. You must finish 3 of the 4 races to be eligible for series awards. You must also be present at the Garland Mountain Event on June 8th to receive your award, as awards are not mailed. Series points do not transfer between short and long courses or across age divisions, so if you are going for an overall series award, you must race either the short course in all races or the long course in all races, and you must race in the same age category across all four races. For 2019 we are using everyone's age on Dec. 31, 2019 as their race age to avoid age-up confusion midway through the series. 4:00 - 7:00 pm Early Registration and Packet Pickup at REI Kennesaw. 30-35 minutes from Woodstock/Canton area. Take I-75 north to I-575 north. Exit at #16 and take left fork of exit towards GA 20 West/GA 140 West. At light turn right onto GA 140/Marietta Highway. GA 140 turns to the left at Waleska Street (there is a Walgreens on this corner). Take a left and head north on Hwy 140. Continue north through Waleska and go another 2-3 miles. Turn right onto Garland Mountain Trail, then turn left on Garland Mountain Way, following the signs to the park. Take Me Directly to On-Line Registration! Camping is not allowed in Cherokee County Parks, however there are several campgrounds along Lake Allatoona, which is 20-30 mins south of Garland Mountain, depending on which location you choose. The closest hotels are in Canton, Georgia and then Woodstock, Georgia is about 10 minutes further south. The race will feature the following age group categories for both the 10k and 13.1 mile race. Awards will be presented to the top three male and female finishers in each age group, in each race. We will also recognize the top three overall male and female finishers. All kids race participants will receive a finisher medal. All 13.1 Mile Finishers receive a finisher medal and sticker. $100 cash prize to first place overall male and female runner in the long AND short course event! In addition to prizes and medals for the top 3 overall male and female, medals will be presented to the top 3 finishers in each age category. All of our first place winners (overall and age group) in the 13.1 mile race will receive a custom podium shirt. All finishers in the 13.1 mile race receive a finisher medal and sticker. The awards ceremony for the 10k race will take place at approximately 10:00 am. The awards ceremony for the 13.1 mile race will take place at approximately 11:00 am to allow the majority of half marathon racers to finish. You must be present at the awards ceremony to receive your award. Awards and prizes will not be mailed. If you win something and bail on the awards ceremony, your prize will be added to the raffle goodies pile or given to a race volunteer. If you finish the race after the awards ceremony but earn a medal in your category, you will receive your medal as you finish. A portion of the proceeds from this event will benefit Friends of Garland Mountain Trails to be put towards trail maintenance and construction at the park. This will help them complete the remaining trails in the park, bringing the total mileage up to 17.6 miles total. There are currently 15+ miles of trail completed at Garland Mountain. We will also offer a FREE kids 10 and under race, which will take place on a short section of the Palomino Trail and is approximately a quarter of a mile long. All kids race participants will receive a finisher medal. The kids race is not officially timed and no pre-registration is required, however parents must sign a waiver for their children and pick up a kids race number, available at race check-in. All entries include a soft, cotton blend T-shirt, event swag item and free photo downloads courtesy of the Georgia National Guard. Sizes guaranteed if you register before May 25. After May 25, sizes are first come-first served. If a size is shown in the menu when you register, it is still available. Shirts run true to size. Register early, you will want one of our shirts! 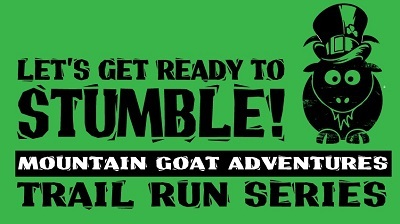 If you register late and we run out of event specific shirts, you will receive a Mountain Goat logo shirt with your registration. You must FINISH in 3 of the 4 races to be eligible for series awards and you must also be present at the Garland Mountain Event on June 8th to receive your award. Awards will not be mailed - any unclaimed awards and prizes will be raffled off to our fabulous race volunteers and those who stick around for the awards ceremony at the Garland Mountain event. Series points do not transfer between short and long courses, so if you are going for an overall series award, you must race either the short course in all races or the long course in all races. Series points do not transfer between age groups, so you need to race in the same age group for the entire series. All races count toward final series rankings, there are no dropped races. In the event of a tie in an age group, the racer with the higher placing at the Garland Mountain Series Finale event will receive the higher ranking. The top 20 in each age group will receive points..1st place will receive 20 pts, 2nd will receive 19 pts, and so on down to 20th place, which receives 1 pt. You will also get 1 bonus point for each racer you beat, so if you place high in a large field, you will receive more points than the same placing in a small field. The race will run rain or shine, however, the Race Director reserves the right to cancel or modify segments of the event as deemed necessary for participant safety. No refunds will be given in the event of an act of God that requires cancellation of the race for the saftey of participants. Once the race has started, no refunds will be given due to delayed start or early conclusion of the race.